Fig. 2. Effects of antioxidants on the growth of T. pallidum. Treponemes were grown in culture with SflEp cells in TpCM base medium with 5% oxygen and various antioxidants as listed in Table I. 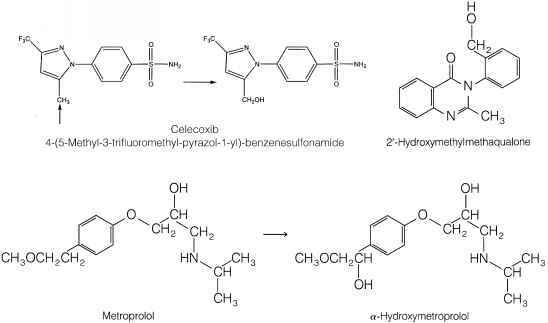 Column 1, no antioxidants; column 2, catalase; column 3, catalase and superoxide dismutase; column 4, mannitol, histidine, C0CI2, and cocarboxylase; column 5, histidine, C0CI2, and cocarboxylase; column 6, mannitol, C0CI2, and cocarboxylase; column 7, mannitol, histidine, and cocarboxylase; column 8, mannitol, histidine, and C0CI2. Analysis of Effect of Various Antioxidants on Growth of Treponema pallidum. To study the effects of antioxidants on the growth of T. pallidum in coculture, multiple flasks of SplEp cells are infected with treponemes in TpCM containing various antioxidants. When the cocultures have been prepared, the caps on tissue culture flasks are loosened. All cultures are incubated at 34° in a Tri-Gas incubator (Forma Scientific), where a microaerophilic environment (5% O2, 5% CO2, and 90% N2) is maintained throughout the cultivation period. Treponemal growth is measured every 2 days over 16 days by harvesting and enumerating spirochetes from one or two flasks per antioxidant condition. We have found that treponemal growth in coculture is markedly enhanced by the addition of superoxide dismutase, catalase, histidine, and mannitol (Fig. 2), whereas C0CI2 and cocarboxylase make smaller contributions. Purification of Recombinant Neelaredoxin. Whereas quantities of native superoxide reductases sufficient for enzymatic analysis have been purified from hundreds of liters of cultivable organisms,16'l9,30'31 the inability to continuously cultivate T. pallidum precludes this approach with the treponemal homolog, TpNlr. To obtain TpNlr for enzymatic analysis, the nlr gene is overexpressed in the heterologous host E. coli. 1. The nlr gene is amplified from T. pallidum chromosomal DNA, using primers 5'-CCATGGCATATGGGACGGGAGTTGTCG-3' and 5'-TTAAGCTT GGATCCCTACTTACCTGACCACAC-3', which contain engineered Ndel and BamHI sites (underlined), respectively. The Ndel- and fiamHI-digested polymerase chain reaction (PCR) product is ligated to similarly digested plasmid pT7-7 and transformed into E. coli DH5-a, which are plated on Luria-Bertani (LB) agar containing ampicillin (100 /ig/ml) for overnight growth at 37°. Plasmids purified from 5-ml broth cultures of individual colonies are screened for nlr by both restriction enzyme digestion and nucleic acid sequence analysis. 2. Competent E. coli BL21(DE3) are transformed with a pT7-7: nlr plasmid and plated on LB agar containing ampicillin (100 /ig/ml). 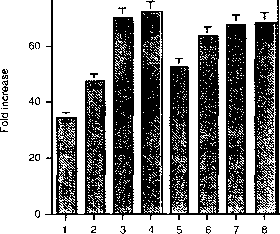 After growth at 37°, an individual colony is used to inoculate 10 ml of LB broth containing ampicillin (100 /¿g/ml) for aerated growth; this is subsequently used to inoculate 1.5 liters of LB broth. 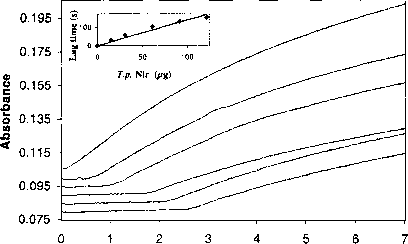 When the OD595 of the 1.5-liter culture reaches 0.8, high-level expression of Nlr is induced by the addition of isopropyl-/i-D-thiogalactopyranoside (IPTG) to 1 mM followed by 6 hr of continued aerated growth. 28 M. J. Pianzzola, M. Soubes, and D. Touati, J. Bacteriol. 178, 6736 (1996). 29 S. I. Liochev and I. Fridovich, J. Biol. Chem. 272, 25573 (1997). 301. Moura, P. Tavares, J. J. G. Moura, N. Ravi, B. H. Huynh, M. Y. Liu, and J. Legall, J. Biol. Chem. 31 L. Chen, P. Sharma, A. M. Mariano, M. Teixeira, and A. V. Xavier, Eur. J. Biochem. 226,613 (1994). operating at 15,000 lb/in2. The lysate is clarified by 1 hr of centrifugation at 39,100g, after which the supernatant is loaded on a column (2.6 x 17.5 cm) containing DEAE-Sepharose CL6B anion-exchange resin equilibrated with 20 mM Tris-HCl, pH 7.8. 4. After washes with the same buffer, a 0 to 1.0 M NaCl linear gradient in 20 mM Tris-HCl, pH 7.8, is applied to the column. TpNlr usually elutes as a blue fraction at an NaCl concentration of ~0.1 M. The blue color results from the Fe3+ oxidation state. Depending on the redox potential of the column fractions as well as the presence of other redox-active species, it is possible that fractions containing TpNlr will appear colorless (Fe2+ form of the protein). In either case, it is best to assay fractions for the presence of TpNlr by either sodium dode-cyl sulfate-polyacrylamide gel electrophoresis (SDS-PAGE) and/or superoxide reductase activity as described below. The best fractions in terms of purity and activity are pooled and concentrated to ~10 ml, using an Amicon (Danvers, MA) concentrator equipped with a PM10 membrane, and applied to a column containing Sephadex G-75 gel-filtration resin equilibrated with 50 mM Tris-HCl-0.3 M NaCl (pH 7.8). The protein is eluted from this column with the same buffer. Enzymatic Analysis of Treponema Neelaredoxin. Although orthologs of TpNlr were originally characterized as SODs,20,32 Adams and colleagues were the first to clarify the fundamental differences between the reaction catalyzed by SODs and SORs.16 Indeed, although Pyrococcus furiosus SOR exhibited a high SOD activity (~4000 U/mg) in the classic cytochrome c reduction assay, the SOD activity of SOR was significantly lower when acetylated cytochrome c was used or in three other SOD assays, demonstrating that SORs have little, if any, SOD activity. Similar results have been demonstrated for homologs from Desulfovibrio desulfuricans,20 Desulfoarculus baarsii,17 T. pallidum,14,15 Archaeoglobus fulgidis,19 and Desulfovibrio vulgaris,21 all of which have measurable but catalytically inefficient SOD activities of 10-70 U/mg. Superoxide Reduction/Superoxide Reductase Oxidation. In the classic cytochrome c reduction assay, a steady state concentration of superoxide generated by xanthine-xanthine oxidase reduces cytochrome c, thereby leading to an increase in absorbance at 550 nm. 1. The assay is performed at 25° in a 1-ml quartz optical cuvette containing 50 mM potassium phosphate, pH 7.8, containing 100 \xM EDTA, 10 ¡iM horse heart cytochrome c, and 7.5 mM xanthine. 32 G. Silva, S. Oliveira, C. M. Gomes, I. Pacheco, M. Y. Liu, A. V. Xavier, M. Teixeira, J. Legall, and C. Rodrigues-Pousada, Eur. J. Biochem. 259, 235 (1999). absorbance at 550 nm is monitored over time. One unit of SOD activity is defined as the amount of protein that inhibits the rate of cytochrome c reduction by 50%. Additional studies have shown that superoxide is capable of oxidizing TpNlr to the Fe3+ state, but not the opposite.14'15 The second-order rate constant for the SOR activity of TpNlr with superoxide has been measured by monitoring the increase in absorbance due to the ferric form of the active site as a function of time in the presence or absence of SODs, yielding values of 108-109 M ' sec-1,14 indicating that TpNlr is a potent antioxidant enzyme. 2. Alternatively, to evaluate individual electron donors for SOR, such as rubre-doxin (Rd), the A495 of reduced Rd is measured in the presence of SOR and superoxide.16 As reduced Rd donates electrons to oxidized TpNlr during the SOR cycle, the A495 increases due to the formation of oxidized (Fe3+) Rd. FIG. 4. Rubredoxin can serve as an electron donor to neelaredoxin/superoxide reductase. At t = 0, 17 ßM recombinant D. vulgaris rubredoxin was added to 50 mM potassium phosphate (pH 7.8)-0.1 mM EDTA in a quartz optical cuvette and the absorbance due to the oxidized form was monitored at 495 nm. Sodium dithionite was added at ~80 sec, resulting in reduction of rubredoxin and the corresponding decrease in the A495 value. This was followed by a gradual increase in the A495 value due to reoxidation from oxygen in the assay buffer. 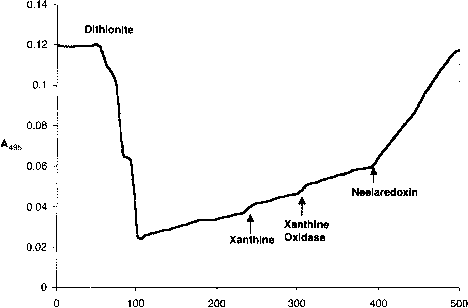 Xanthine (0.4 mM) and xanthine oxidase (0.15 U) were added at 250 and 300 sec, respectively. At t = 400 sec, TpNlr was added to 50 nM. The increased rate of rubredoxin oxidation (AA495) compared with the rate before TpNlr addition was used to calculate a specific activity of 7 /¿mol of rubredoxin oxidized per minute per milligram of TpNlr. of TpNlr in vivo relies on heterologous complementation and analysis of TpNlr expression by T. pallidum. 2. The expression of TpNlr has been examined in T. pallidum by both reverse transcriptase (RT)-PCR and Western blot. For RT-PCR analysis of TpNlr transcript, RNA is isolated from freshly harvested T. pallidum with the Ultraspec RNA isolation reagent (Biotecx, Houston, TX) according to the manufacturer recommendations. Isolated RNA is treated with RNase-free DNase, phenol-chloroform extracted, ethanol precipitated, and resuspended in diethyl pyrocarbonate-treated water along with an RNase inhibitor. RT-PCR analysis is carried out with the Titan one-tube RT-PCR system (Roche Molecular Biochemicals, Indianapolis, IN) and primers specific for neelaredoxin (5'-AGGCAGTAGTGTCGCGTGCGG-3' and 5' - A A AGGTC ACCTC AGGCGCTCC- 3') and flaA (5'-TGAATTATCCTCATGG TTTGTACGTG-3' and 5'-TCAGCACCGCCTTATCATAGATAATC-3'). For each primer set, four reactions are performed: (1) RT-PCR with 50 ng of RNA template, (2) PCR with 50 ng of RNA template, (3) RT-PCR with water only, and (4) PCR with 3 ng of DNA. In reactions without reverse transcription, the RT-DNA polymerase mixture is replaced by the Expand High Fidelity DNA polymerase (Roche). After the RT reaction (45° for 30 min) PCR is performed, using the following parameters: 98° for 2 min followed by 40 cycles of 98° for 10 sec, 60° for 10 sec, and 68° for 30 sec followed by a single terminal extension for 2 min at 68°. One-fifth (5 /Lil) of each reaction is electrophoresed through a 2% (w/v) agarose gel containing ethidium bromide before photography. Using this technique, we were able to detect transcript for TpNlr in freshly harvested T. pallidum, albeit at lower levels than the abundantly expressed flagellin subunit (Fig. 5A). Before immunoblot analysis of T. pallidum, antisera against TpNlr are raised by priming rats intraperitoneally with 20 ¡ig of purified TpNlr emulsified in a 1:1 mixture with Freund's complete adjuvant and PBS, pH 7.4. Booster immunizations consisting of 20 /xg of protein in a 1:1 mixture with Freund's incomplete adjuvant and PBS are administered by the same route on weeks 4 and 6. Anesthetized rats are exsanguinated on week 8 by cardiac puncture. The coagulated blood is centrifuged for 10 min at 2000g, after which the sera are collected.